As digital images start to pile up on your hard drive, the ability to sift through and process them quickly becomes crucial. 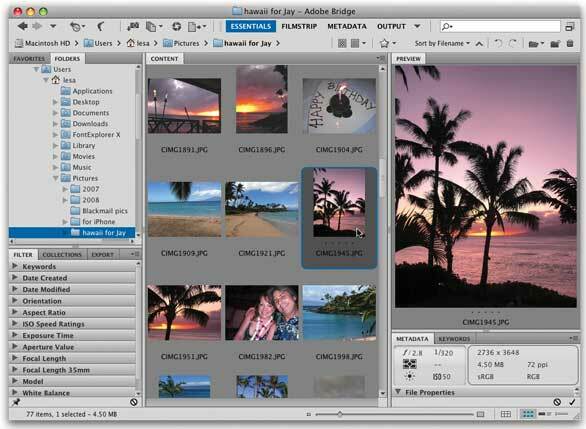 Enter Adobe Bridge CS5, the organizational and image browsing application that ships with all Adobe CS5 applications and collections. While enhancements in this Bridge CS5 update aren’t numerous, or even especially visible, they’re much appreciated. For example, the Path “trail of breadcrumbs” Bar is now editable; batch renaming includes more options, making it easier to use; and you will soon be able to use the new Export Panel to perform drag-and-drop JPEG conversions. There’s increased support for Adobe InDesign files and, perhaps best of all, you can now save your custom PDF or Web gallery settings to use again later. At the top of the Bridge CS5 window, you’ll spot a new resizable Live Workspace area that houses custom workspace buttons, just like Photoshop CS5. The Path Bar—a handy, clickable trail of breadcrumb links—was also enhanced: You can now click to edit the path text manually or drag a folder onto the path to go there. You can also use Bridge CS5 to play full-screen previews of content created with Adobe Flash (SWF, FLV, and F4V files). If you need to rename multiple files, you’ll appreciate the improvements to the Batch Rename dialog box. For example, you can replace all or part of a file name and Bridge shows you a preview of what the new name(s) will be. You can also save your favorite naming scheme as a preset to use later. If you need to convert a slew of images to JPEG format, you will soon be able to use Bridge CS5’s new Export Panel (choose Window -> Export). To use it, you first create a location (preset) for the exported files, drag files to the location queue, and then click to export them. You can use the Image Options tab to let Bridge know if you’d like it to make your images smaller and/or reduce their quality. Save the location with a meaningful name and Bridge adds a new hard-drive icon to the Export Panel. The process takes a few steps but once you get your locations set up, exporting JPEGs becomes a quick drag-and-drop process. Unfortunately, the Export Panel isn't working in the initial Bridge CS5 release, however Adobe expects to correct the problem within a few weeks of the ship date. Bridge CS5 has a similar interface to its predecessor, but some additional under the hood features. By using Bridge CS5’s Output workspace, you can generate a PDF or Web Gallery quickly and easily. However, in Bridge CS4 there was no way to save your settings once you had them just right. Thankfully that’s changed in Bridge CS5; you can now save your settings as a style that you can access later. Other new features in the Output workspace include the ability to add watermarks to individual images within a single PDF (instead of one watermark per PDF page) when using the Output to PDF option, and the Output to Web Gallery option includes new Appearance settings that let you control photo size and quality. Bridge CS5 also has a much closer relationship with InDesign CS5 in that you can preview individual pages of an InDesign file—beyond the first page—as well as use the Metadata panel to view the names and paths of any linked files inside the InDesign document (you can also control-click the InDesign CS5 file and choose Show Linked Files). However, this only works with InDesign CS5 files, not CS4. For the multiple page preview to work in Bridge, you must first turn it on in InDesign CS5’s preferences and then save your files in CS5, which makes this feature seem fairly useless except in closed workgroup situations where all production artists are trained to turn this option on. Bridge just keeps on getting better; the more you use it, the more you’ll find yourself relying on it. The Export Panel will be a handy addition for drag-and-drop image JPEG processing, though it’ll be exciting to see how it develops in future versions of the program (imagine sending your images to other Web sites directly from Bridge). The ability to save custom PDF and Web Gallery settings just makes good sense, and the InDesign integration will be super useful—that is, once everyone upgrades to InDesign CS5.